This post shows you a briefly of this tool called “Universal Worklist Configuration Troubleshooting”. 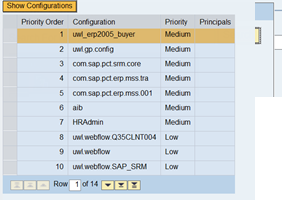 This feature allows the user to retrieve some information about an UWL configuration. Checking which XML configurations are available for such user, role or group. Looking for ItemTypes and locating the Configurations (XMLs) where they are defined. Acess the SAP Netweaver Enterprise Portal, using the “Full Qualified Domain Name” (reffer SAP note #654982). It should be like: http: //<portal URL>.com:<port>/irj/portal . Login with an administrator user or an user with superadmin role. Now that you are inside the “Universal Worklist Configuration Troubleshooting”, let’s see how to identify which XML configurations are available for each user, roles or groups. There is a table on top of the page that shows all XML you have on your system. Just over this table there is a field where you can filter by user, role or group. Select the object and click apply. 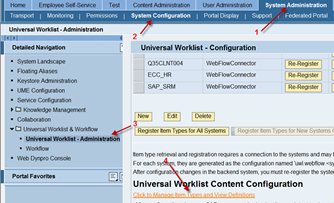 About the second table on the “Universal Worklist Configuration Troubleshooting” page there is also a feature to show if an itemType are conflicting on the configuration XMLs, it is on the second table on the page. Select the External Type on the table in the left. Select the internal type, related to this External type. This is the most complete screen on this tool. You can filter by “Item type”, Default Action, Associated View or “Effective Configuration”. And the tool is going to show you the relevant part of the XML for the specific ItemType and for a specific View.